On an impossibly lovely landmarked brownstone block near the border between north Park Slope and Prospect Heights, the 1890s townhouse at 212 Saint Johns Place is a testament to the idea that they don’t make them like this anymore. This historic brownstone, on the market for $3.895 million, will definitely appeal to anyone smitten with the idea of living in a beautifully preserved home from the 19th century rather than constructing a modern interior with contemporary flair. 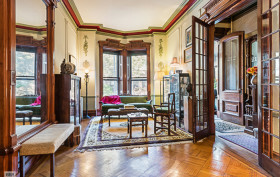 Once the home of New York City mayor William J. Gaynor (1910-1913), this two-family neo-Grec townhouse is filled with original architectural details from parquet wood floors, richly-carved mahogany trim and ten-foot parlor floor doors to the exquisite wood-carved cabinet built into the third floor landing.